Nicholas Allen Moore, 24, of Womelsdorf, passed away in the afternoon hours Wednesday, March 22, 2017, of natural causes in St. Joseph Medical Center. Born July 21, 1992, in West Reading, he was a son of William W. & Wanda J. (nee’ Henne) Moore, of Womelsdorf. 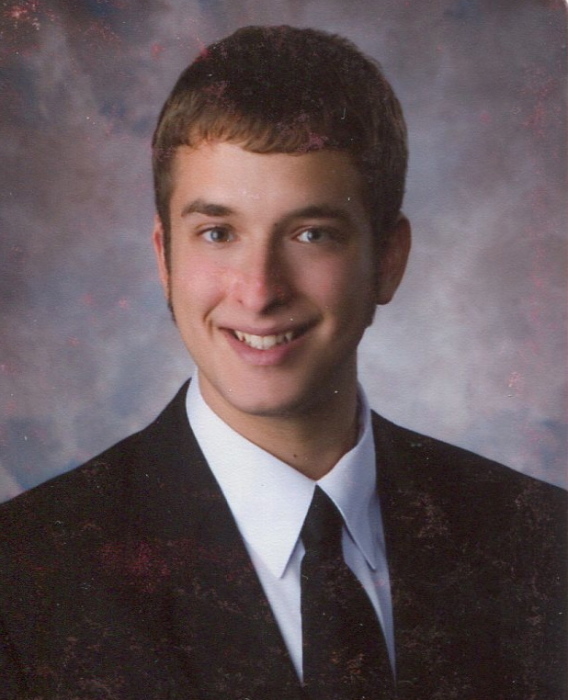 A 2010 Graduate of Conrad Weiser High School, Nick was a student at Penn State University and was finishing his last class at RACC to finalize his Degree in Biochemistry Engineering. Nick loved to sing and was in the Glee Clubs both in High School and College, and performed with the Hi Lo's at PSU. He also performed with the Nittany Knights Barbershop Chorus in State College. He was very active in the music program at Conrad Weiser and Performed in the Jazz, Concert, and Marching Bands. Since Middle School, Nicholas participated in the all the Drama Club Plays and Musicals at Weiser, and continued his love of performing at Genesius Theatre in Reading, last performing Summer of 2014 in the role of Abraham in Altar Boyz. He was also a member of Zion United Church of Christ, Womelsdorf. In addition to a Supportive , Loving Family, and a Team of Nurses and Doctors, Nicholas was Blessed to have an Amazing Church Family, Wonderful Friends, and Caring Neighbors who all provided much needed support over the past couple years during his illness. In addition to his parents, he is survived by his siblings: Melissa A. Moore, Middletown, NY; Billy A. (Delight M.) Harvey, Robesonia, PA; his nephew, Cody Harvey and his niece, Madison Harvey, His Nana, Evelyn Medici, Honeoye Falls, NY, and his Beloved Cats who watched vigil over him ! Also survived by Loving Aunts, Uncles, & Cousins. He was predeceased by his brothers: Philip A. & Max E. Moore, whom he now has the opportunity to know. Memorial Services for family, close friends, and neighbors will be held Friday, March 31, 2017, at 10 am at Zion United Church of Christ, 12 S. 2nd St., Womelsdorf, with Pastor Melissa Burkhart, officiating. The family will receive friends following the service in the social hall of the church. Burial will be in Womelsdorf Union Cemetery Friday at 2:30 PM. A Celebration of Life Service will be held Saturday, April 1, 2017 at 1 PM in the Auditorium of Conrad Weiser High School, 44 Big Spring Rd., Robesonia, PA 19551. The family will receive friends following the service. Nick was full of life, love, joy, talent and intelligence, and he touched so many lives with his "Believe in Moore" posts on Facebook, and they would like to invite you to join in this Memorial Celebration. The Family asked that you flood the audience with a Sea of Blue and White, welcoming your "Believe in Moore" Shirts or Penn State garments. In lieu of flowers, contributions in memory of Nicholas A. Moore, may be made to the CWHS Musical c/o Conrad Weiser High School, Attn: Stacy Miller, at school address above. The Family hopes that we all honor Nick by striving to be more like him; loving, kind, caring, and accepting of all as friends. And keep his spirit of facing any challenge, no matter how large, with determination, a positive attitude and a smile on our faces. Not being spiteful for what we don't have, but thankful for what we do.